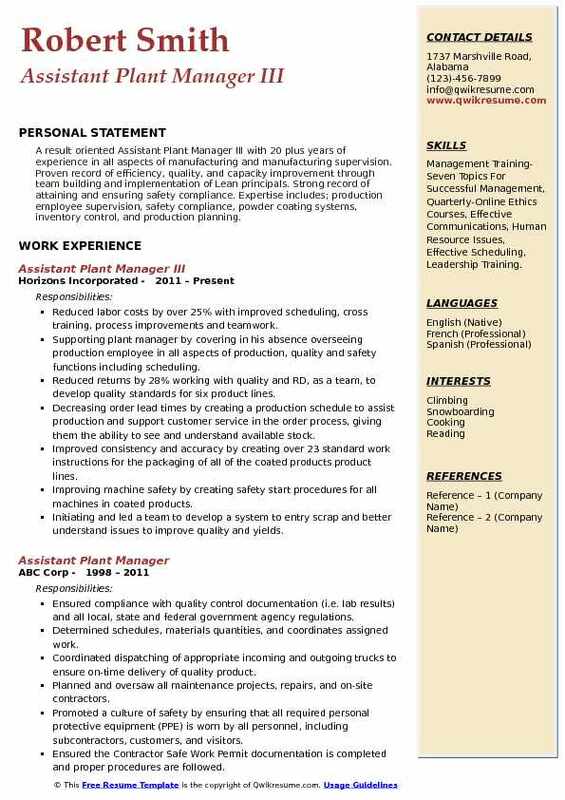 Assistant Plant Manager reports to the Plant Manager and undertakes general plant operation tasks and also executes various other job description that may include all or some of the following job roles – assisting in organizing and managing routine plant operation activities, managing workers in achieving daily production targets, resolving issues in the absence of plant manager, maintaining plant related documentation, implementing plant improvement techniques and scrap reduction techniques and ensuring materials, equipment and supplies are readily available for carrying out production activities. 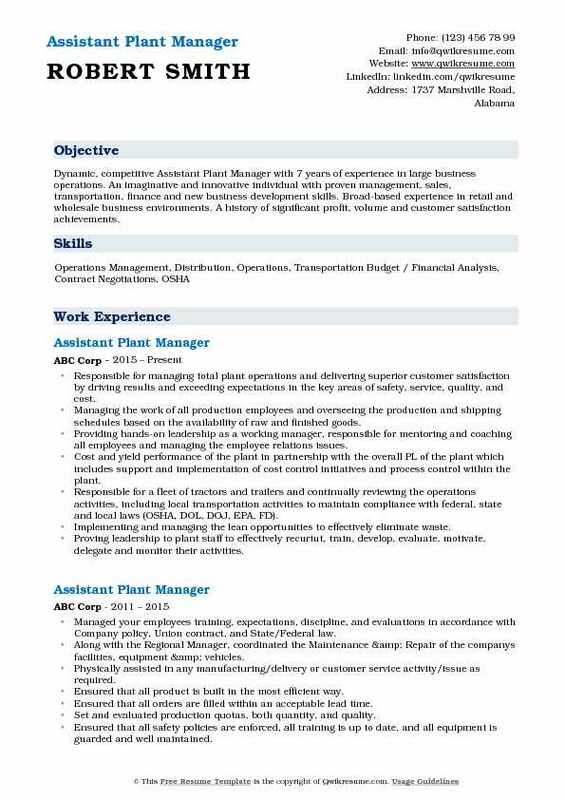 To make an enhancing career as an Assistant Plant Manager, candidates are expected to highlight in the Assistant Plant Manager Resume skill sets such as – plant operation expertise, adequate knowledge of plant or factory principles, industrial technical knowledge and sound knowledge of safety, quality, inventory, and production processes. A degree in the field of Business administration or Industrial management is considered mandatory for this employment. Summary : Assistant Plant Manager with 11 plus years of experience in the Manufacturing domain is seeking to engage in a position in which there is a strong desire for leadership skills and a need for managing personnel, departments, or organizations. 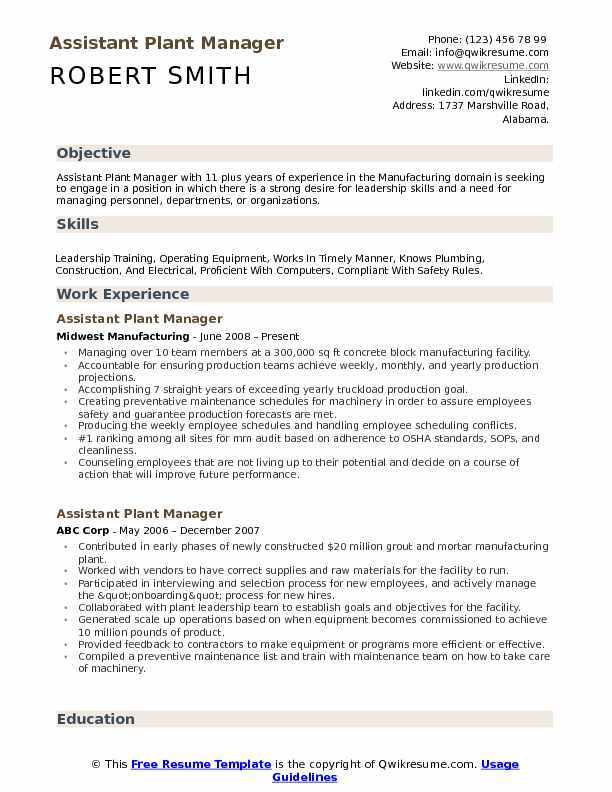 Skills : Leadership Training, Operating Equipment, Works In Timely Manner, Knows Plumbing, Construction, And Electrical, Proficient With Computers, Compliant With Safety Rules. Managing over 10 team members at a 300,000 sq ft concrete block manufacturing facility. Accountable for ensuring production teams achieve weekly, monthly, and yearly production projections. Accomplishing 7 straight years of exceeding yearly truckload production goal. Creating preventative maintenance schedules for machinery in order to assure employees safety and guarantee production forecasts are met. Producing the weekly employee schedules and handling employee scheduling conflicts. #1 ranking among all sites for mm audit based on adherence to OSHA standards, SOPs, and cleanliness. Counseling employees that are not living up to their potential and decide on a course of action that will improve future performance. Visiting menards stores to discuss any comments or concerns that they might have with the product. Increased profit margins 21% on void cubes with the new palletized design. Increased overall plant utilization by about 10% by helping schedule efficient production runs based on weekly production forecasts, line capability, and vat availability. Identifying and cost-justifying the capital projects that lead to improved plant performance. Working with RD during production trials and later during the actual production to make sure product parameters are within plant control. Making recommendations to RD on the formulation based on how the product runs through the system to reduce losses and gain product attributes. Resolving union issues brought up by employees or other management staff by negotiating with union steward and business agent. Working with the union to come up with innovative ideas to address grievances that arose due to behavioral issues. Working with cost accounting and procurement on all new formulas to make sure they are set-up in the system and items have been ordered to timely first production run. Working with quality assurance department during customer and internal plant audits. Successful implementation of level 3 SQF for past 6 years with an excellent rating. 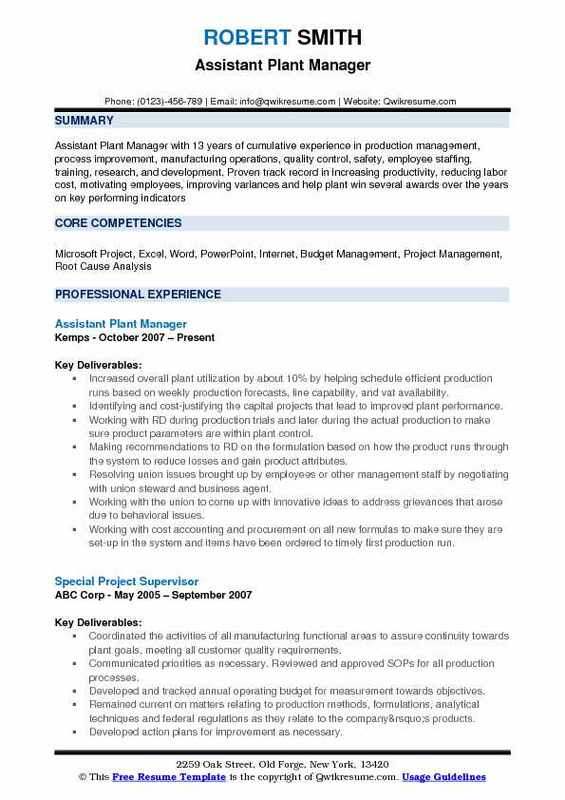 Objective : IAssistant Plant Manager with 3 plus years experience in Electric Production Generating plants, Paper Manufacturing Mills and Fastener Manufacturing plant. SME on solid fuels and handling. Experienced in Safe and reliable Operations and maintenance leadership, administration, planning, supervision and personal development. Responsible for supervision of primarily operators and operations teams at multiple locations throughout working career. Assisting the Quality Assurance in development of new products/processes and improve current products/processes. Establishing procedures and supervise all experimental and test runs, reporting all results. Managing the inventory of off-spec materials, including the scheduling and reworking of products as needed. Implementing and managing the safety and regulatory programs to ensure the long-term safe operation of the facility. Taking personal responsibility to engage in food safety practices to prevent hazards that cause foodborne illness or injury. Qualifying and training individual will provide as a back-up in the event of an absence of another employee. Understanding and implementing the Continuous Improvement principles. Creating team-based environment encouraging open communication and seeking input regarding production, safety and quality issues. Promoting a continuous improvement philosophy by collecting ideas from employees and managers on ways to improve production output and assure the safety of employees. 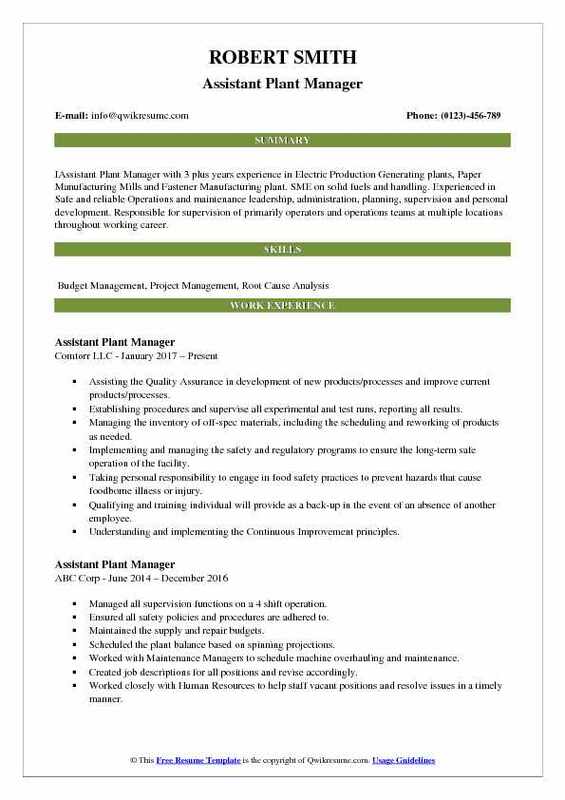 Summary : Assistant Plant Manager with 8 plus years of experience is seeking a position within an organization where demonstrated skill in strategic planning, quality assurance and attention to detail can be translated into improved growth and profitability. Planning, organizing, directing and running optimum day-to-day operations to exceed our customer's expectations. Responsible for production output, product quality, and on-time shipping. Implementing the strategies in alignment with strategic initiatives and provide a clear sense of direction and focus. Preparing the internal and corporate quality documentation and reports by collecting, analyzing, and summarizing trends for failed processes, stability studies recalls, and corrective actions. As a member of the management team, set annual goals and continuous improvement initiatives. Monitoring the product quality target levels to ensure compliance with customer expectations. Implementing the vibration analysis program for large industrial helical gears installed. Summary : Strategic visionary and results-oriented Assistant Plant Manager III with 21 plus years of experience and with a proven track record of implementing best practices that streamline processes, improve employee performance and positively impact bottom-line results. Experienced in team-oriented environments and knowledgeable about lean-manufacturing ideals and training. Responds to challenges with determination, focus and the ultimate goal of developing cutting-edge solutions. Operating the facility to continuously supply products safely and economically. Maximizing reliability in order to avoid unscheduled process interruptions. Monitoring and recording historical data to evaluate the facilities performance. Creating the job plans that show required documentation such as moc information, QA needs. Pids, spec sheets, required skill crafts and duration. Developing the job steps for work to be performed including - contractor skills, parts and materials, special tools, technical info/drawings, and environmental, health and safety requirements. Coordinating the review of work backlog with distribution and reliability center personnel to ensure that all work is appropriately prioritized, planned, scheduled and executed. Creating and receiving the requisitions for parts and external maintenance services. Working with distribution to ensure uninterrupted supply of products to the customer. Performing the daily rounds looking for abnormalities in process designs and/or equipment malfunctions. Conducting the periodic inventories to ensure critical spares and consumables are available. 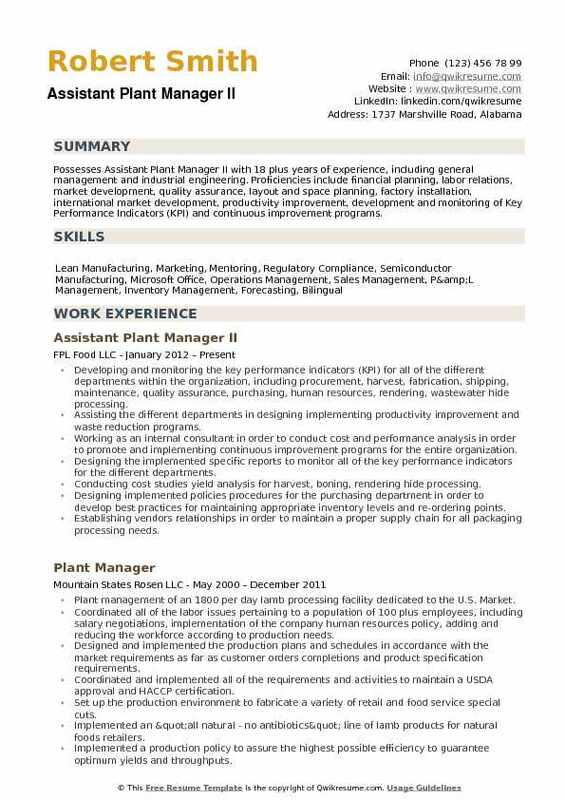 Summary : Dynamic, competitive Assistant Plant Manager with 7 years of experience in large business operations. An imaginative and innovative individual with proven management, sales, transportation, finance and new business development skills. Broad-based experience in retail and wholesale business environments. A history of significant profit, volume and customer satisfaction achievements. Responsible for managing total plant operations and delivering superior customer satisfaction by driving results and exceeding expectations in the key areas of safety, service, quality, and cost. Managing the work of all production employees and overseeing the production and shipping schedules based on the availability of raw and finished goods. Providing hands-on leadership as a working manager, responsible for mentoring and coaching all employees and managing the employee relations issues. Cost and yield performance of the plant in partnership with the overall PL of the plant which includes support and implementation of cost control initiatives and process control within the plant. Responsible for a fleet of tractors and trailers and continually reviewing the operations activities, including local transportation activities to maintain compliance with federal, state and local laws (OSHA, DOL, DOJ, EPA, FD). Implementing and managing the lean opportunities to effectively eliminate waste. Proving leadership to plant staff to effectively recuriut, train, develop, evaluate, motivate, delegate and monitor their activities. Helping to lower expenses which led to the most successful year the plant ever had. 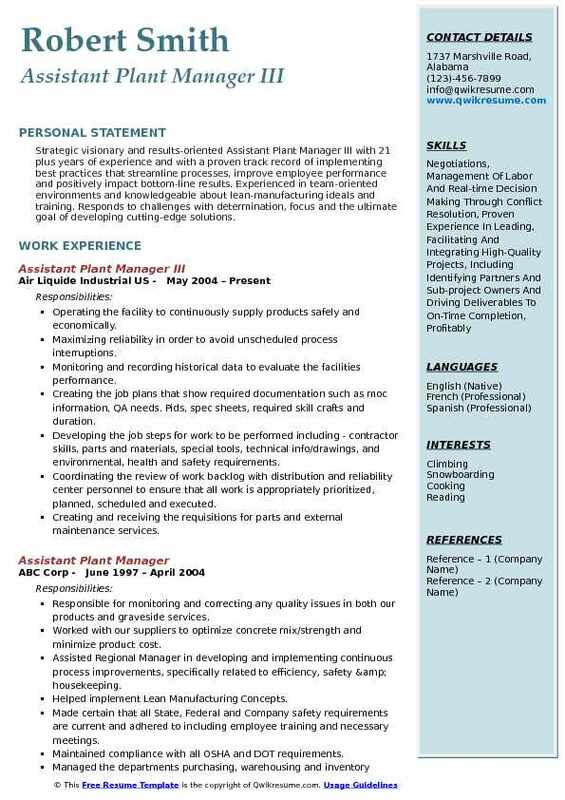 Summary : A result oriented Assistant Plant Manager with 6 plus years of experience in the Manufacturing domain with proven abilities in strategic planning, managing projects, improving the efficiency of operations, team building, and detail project information to determine the effective process for operations. Offers outstanding team leadership, behavioral management, and conflict resolution skills. Managing day to day operations of two pallets service centers that consisted of 125 employees. Developed a program to minimize awaiting wash pallets saving $21,600 a year. Developed a program to streamline the teardown program saving 5,400 pallets yearly equating to $7,614. Developed a new training program adopted company-wide which reduced turnover by 35% and increased productivity by 21%. Reduced consumable cost by 41% by implementing new ordering and usage procedures. Establishing and maintaining the roles and responsibilities for personnel under your management. Delivering regular safety team communications and organizing monthly safety company meetings. Controlling all associated operational costs according to the prevailing annual budget forecast. Supporting the planning, development and overall management of project budgets, in collaboration with VP and CEO. Recruitment, training, and development of warehouse and Senior Management staff. Solving disputes and complaints in a professional manner and within guidelines. 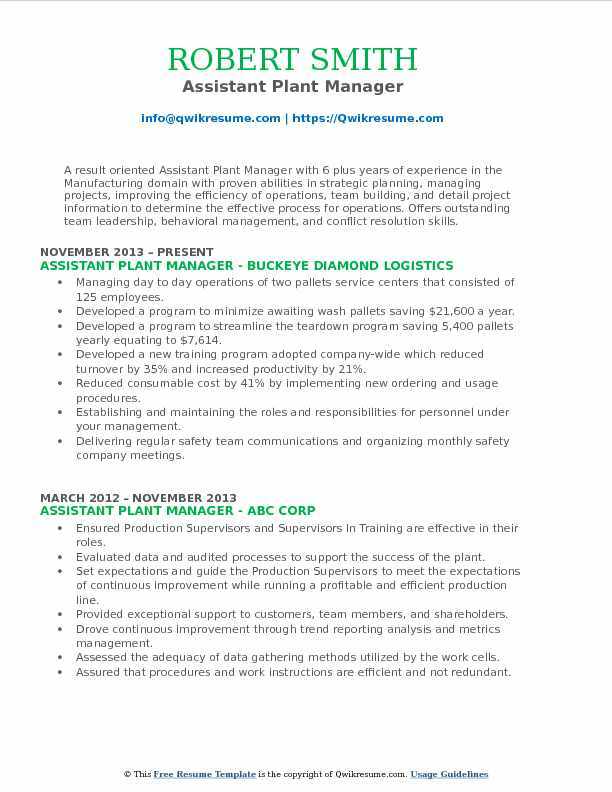 Objective : Assistant Plant Manager with 4 plus years of experience in the Manufacturing domain is seeking a position in which I can utilize my communication and leadership abilities to advance the success of the organization. Assisting the Plant Manager with the direction and coordination of safe and efficient manufacturing plant operations. Directly supervising the shift supervisors and maintenance supervisor/manager and indirectly supervises the assistant shift supervisors, machine operators, maintenance technicians, needle board technicians and material handlers. Working collaboratively with lab team and shipping team as needed. Assisting with the management of work crews including ensuring appropriate staffing levels, employee issues, and production schedules are met. Supporting the manufacturing team by assisting with positive coaching and training of staff members as needed. Assisting with evaluations, training plans and goal setting as needed. Ensuring that the right people are in the right places at the right times, that they are trained, and mentored to develop to be their personal best. Upholding the Agru America and OSHA safety practices/guidelines to ensure a safe work environment for everyone. Continuously collaborating with safety team, management team and employees to identify and improve upon safe work practices, accident avoidance, and daily safety awareness. Under the direction of the plant manager and management team, assisting with the development and improvement of manufacturing processes and procedures to include but not limited to efficiency strategies, lean manufacturing, and ISO certification/documentation. 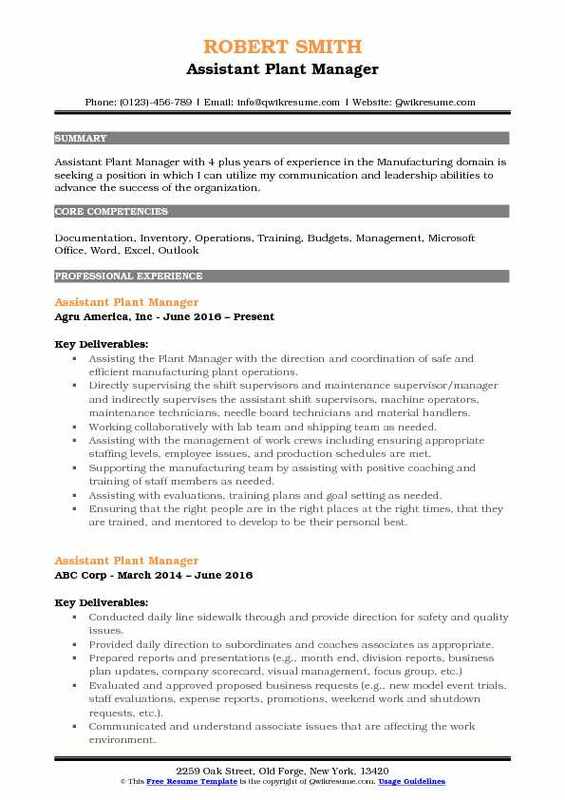 Summary : A result oriented Assistant Plant Manager III with 20 plus years of experience in all aspects of manufacturing and manufacturing supervision. Proven record of efficiency, quality, and capacity improvement through team building and implementation of Lean principals. Strong record of attaining and ensuring safety compliance. Expertise includes; production employee supervision, safety compliance, powder coating systems, inventory control, and production planning. Skills : Management Training- Seven Topics For Successful Management, Quarterly-Online Ethics Courses, Effective Communications, Human Resource Issues, Effective Scheduling, Leadership Training. Reduced labor costs by over 25% with improved scheduling, cross training, process improvements and teamwork. Supporting plant manager by covering in his absence overseeing production employee in all aspects of production, quality and safety functions including scheduling. Reduced returns by 28% working with quality and RD, as a team, to develop quality standards for six product lines. Decreasing order lead times by creating a production schedule to assist production and support customer service in the order process, giving them the ability to see and understand available stock. Improved consistency and accuracy by creating over 23 standard work instructions for the packaging of all of the coated products product lines. Improving machine safety by creating safety start procedures for all machines in coated products. Initiating and led a team to develop a system to entry scrap and better understand issues to improve quality and yields. Implemented 5s to improve, safety, inventory accuracy and housekeeping for the plant. Introducing the lean concepts to production employees to empower and make them a key part of important solutions. 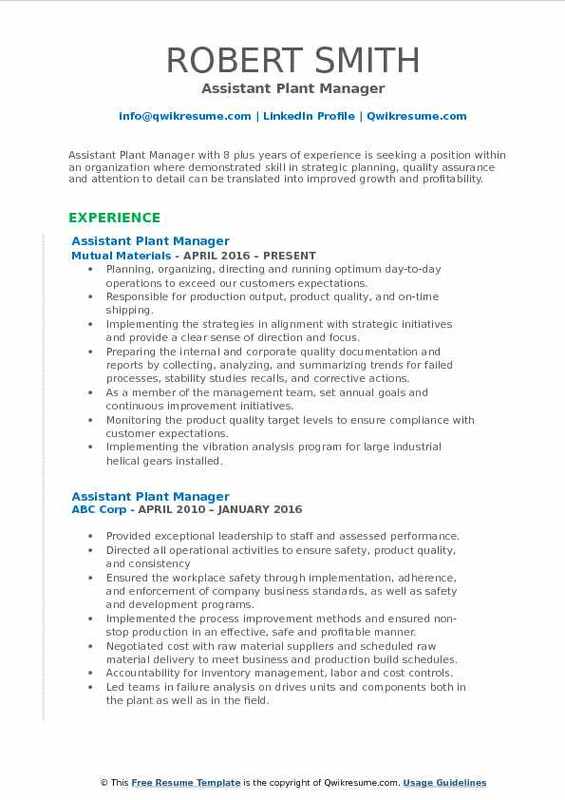 Summary : Possesses Assistant Plant Manager II with 18 plus years of experience, including general management and industrial engineering. Proficiencies include financial planning, labor relations, market development, quality assurance, layout and space planning, factory installation, international market development, productivity improvement, development and monitoring of Key Performance Indicators (KPI) and continuous improvement programs. Developing and monitoring the key performance indicators (KPI) for all of the different departments within the organization, including procurement, harvest, fabrication, shipping, maintenance, quality assurance, purchasing, human resources, rendering, wastewater hide processing. Assisting the different departments in designing implementing productivity improvement and waste reduction programs. Working as an internal consultant in order to conduct cost and performance analysis in order to promote and implementing continuous improvement programs for the entire organization. Designing the implemented specific reports to monitor all of the key performance indicators for the different departments. Conducting cost studies yield analysis for harvest, boning, rendering hide processing. Designing implemented policies procedures for the purchasing department in order to develop best practices for maintaining appropriate inventory levels and re-ordering points. Establishing vendors relationships in order to maintain a proper supply chain for all packaging processing needs. Reducing inventory levels by 40% and maintain levels in accordance with the overall needs of the organization and its capital limitations. Developing the customer base in order to satisfy the volume price requirements.